Creating that perfect silhouette happens in two ways: (1) the way in which your clothing is cut or tailored and (2) the correct belt and where it is worn. It is not enough to have the right belt, it must be worn in the right place. Belts are an under-appreciated accessory in my opinion. They can add sparkle to a classic, accentuate curves, polish an outfit and create the ultimate miracle of helping you appear slimmer. And, like most things, it is worth investing in some classic pieces and playing around with lesser expensive options for seasonal trends. To maximize a belt’s effect remember this: You have a waist and you have hips. These are not the same. Your waist is the crease you find when you bend sideways. It is above your hips – those are defined by your bones. Most low-rise jeans hit right at the top of your hips bones. Wearing belts in these two areas will do different things to your silhouette. 1. A wide, thick belt on your waist will instantly create curves and highlight your waist. 2. A thinner, lower-slung belt on your hips will elongate you by drawing the eye downward. 3. A wider, obi-style belt is great for a shirt/skirt combination as well – it hides the messy tucking that has to happen. 4. A skinny belt over a cardigan at the waist keeps bulky sweaters from overtaking you. Leave the cardigan slightly open or only button the center button. You don’t want to look like a cinched up burrito. 5. 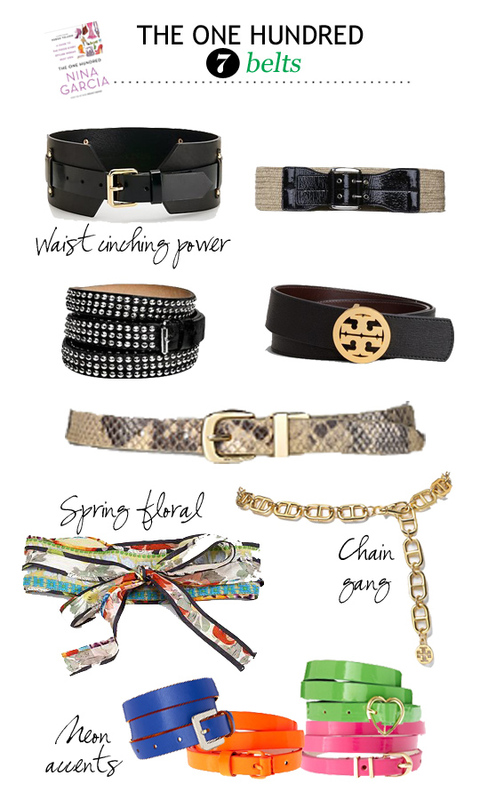 The more embellished the belt – or the more powerful the statement, the simpler your jewelry needs to be. 6. In any extreme pant – high-waisted or low-waisted, the skinnier the belt should be. Want to learn more about belts? Of course you do. Pick up a copy of Nina Garcia’s “The One Hundred” for yourself! We’re working our way through all 100 items to assemble the perfectly stylish, workable collection. Okay so here’s the thing. I lost my waist long ago–hmmm about the time I got pregnant with my youngest. Belts feel like the opposite of what I want to wear. Plus…apparently you can only be a size 2 to find a belt that fits.